The GM trucks that PUTC used were not the ones with the Max Trailering Package, featuring 3.73 rear axle ratio. This means that they were not rated at the class-leading 11,500 pound max-tow rating, or the 2,007 pound max-payload rating with the 5.3L EcoTec3 V8. Why didn’t they? Because the option won’t be available until Q4 2013. Had PUTC had waited until then, chances are the results would have been quite different. Read the full comparison on Pickuptrucks.com. I still think they were too conservative with these trucks. Yes they are good trucks and better than the last but in this game you need to push things or you will get left behind. There will be plenty of strategic updates to come as the model years continue. No doubt, this is pretty disappointing considering these are GM’s latest trucks. And in this hotly-contestant segment, GM cannot afford to fall behind. But so far this is only one comparison test, and while I don’t rely on an automotive critic’s review of a vehicle, I do hope the reviews in general are favorable for the sake of profit for GM. The Malibu fiasco ( despite the fact that the Malibu is a great car) has already had a bad enough impact on GM, and things like this will only continue to bring more ridicule. I gotta admit, Ford and Dodge are dominating this segment. Their tech is more attractive than what GM is currently offering. But the newest Silverado/Sierra are awesome trucks that’ll only improve as they develop. Honda Ridgeline was truck of the year once, how often have you actually agreed without movie critics on which movies are the best? I really put little worth on ratings like this its up too us the consumer too do our own homework deciding. Additionally when you actually read the article I don’t find it very informative and do not get why they chose the same F-50 that they placed lower last year. Apparently a 5.3 v8 getting better mpg than a 3.5 souped up v6 is not big news although it is too me and having seen the 2014 trucks in person I find them much better looking than the flat sided and overall ugly f-150. These new gms are terrible looking from the front. 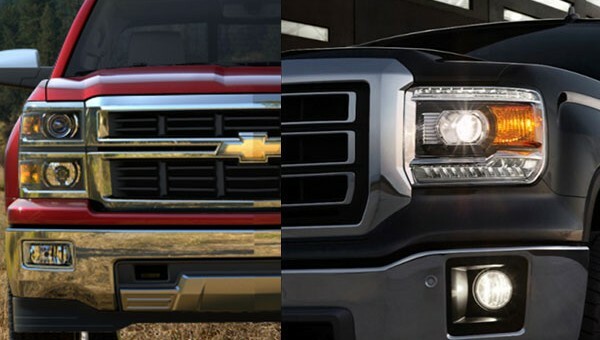 I mean like wtf is going on with the headlights and huge grill, I personally think they are trying to hard and need to tone it down. For crying out loud they look like a asian with swollen eyes that are far apart. And btw do away with the stacked headlights already its not the 80’s anymore. Sorry just my rant for the day. What I would have liked to have seen included the 5.3 and 6.2 GM trucks, each with their max tow package, as well as an Ecoboost, 5.0 and 6.2 Ford. Also I would have preferred the results grouped by non-towing performance, light towing performance, medium towing performance and interior opinion. That way readers can better evaluate based on what their priorities are. Anyhow, I like seeing the performance results. What I don’t like is reading evaluations and opinions. Wow, I just realized that the GM trucks are notably lighter than the group with the Nissan being the next heavier. This doesn’t surprise me at all. GM’s “wait and see” attitude with truck advancement is not going to win them any comparos, but the real test comes with consumers, and the truck market has the most conservative buyers in the entire industry and I think the GM trucks will do well in sales because they are not making any big moves. We’ll see though. Excellent. Third and fourth where they rightfully belong. Wasted opportunity and time. They have FREE maintenance and Texas Editions, but the Max Trailer Package won’t be available until Q4? How could this possibly happen with your most important product line? What a joke! Strategic updates in model years to come? Are you serious? These are brand new totally re-designed trucks! I guess I need to try some of that Akerson,Reuss and Barra Kool-Aid, must be awfully good stuff. and now the new ford is coming out next year, oh oh, will the 6.2 engine coming soon make it that better ? GM appears to do this with several of its new products , ie , meet the competition in a conservative manner so that it it is a reasonable alternative . The problem here is that even if they plan to upgrade these products yearly now , GM never gets ahead of the competition for they don’t start there to begin with . The 2014 Impala is the exception , superb design and it will be a big seller , so too is the current Cruze , Equinox . Suggestion for GM , prototype the interior first , get the dash and seating aced , then design the exterior around it . Finish it off with second to none engines and drivetrain performance ! The hood line to meet the base of the windshield at the same level , so too the side windows and as much as possible the the trunk . This opens up the interior and creates a spacious environment , this is hugely important in a market segment where your entry model has the smallest wheelbase ie the Malibu . I believe they are good trucks, will probably have the best hp/mpg/towing ratings, lots of good features. I’ve always been a GM fan, but for some reason, these trucks just don’t get me pumped to go out an order one like the 07 models did. Sorta like buying a really good appliance. Maybe if the 8-speed auto was ready, or a small diesel, or stand-out styling would get me a little more excited. A good plan to cover all the bases would have been to have the 2014 Silverado as-is to attract the traditional, the fleet, and the conservative buyers, and use GMC to create the love it or hate it, standout-from-the-crowd design to get attention from those that want something really different – as different as the Impala is from the platform sharing XTS. That would give GMC a lot more reason to exist as a separate division. It doesn’t matter if the Max Tow was available at testing for Chevy/GMC, it wouldn’t qualify.1) For the Chevy/GMC, Max Tow isn’t available on the 5.3 with a four full-size doors (Max Tow on 5.3 is double cab only. The crewcab with 4 full-size doors is one of the requirements.2) To get Max Tow with 4 full-size doors, you have to go up to a LTZ or High Country Model and add a 6.2 which puts you over the max $45k figure. Staying under $45k is was one of the requirements.Therefore even if you had it the Max Tow available at this time, it cannot be done for the 5.3 with a crewcab or under $45k with a 6.2L.